A child who will be guided by the "hands of God" will determine the name of the new pope for Egypt's Coptic Orthodox Church who will succeed Pope Shenouda III, who died in March after leading the Church for 40 years. Last Monday, 2417 voters chosen by the Coptic church narrowed down the field of potential popes from five to three. On Sunday, an "altar lottery" at St Mark's Cathedral in Abbasiya, Cairo, after the 8am Mass, will determine which of these finalists will lead Egypt's Coptic community. As many Copts around the world continue a three day fast leading up to Sunday's lottery in a bid to ask God to gift them with a "good shepherd," each of the three finalists voluntarily chose to go to the monastery he was ordained in for a stint of praying and contemplation. In an exclusive statement to Ahram Online, Father Angaelos Isaac, secretary of the acting Pope Archbishop Pachomios, detailed lottery proceedings. The acting Pope will write the names of the three finalists in front of the congregation on three papers. The three papers will be folded, tied with red ribbon, marked with the acting Pope's stamp as well as late Shenouda's stamp and then placed inside a transparent box on the altar to be sealed with red wax. At this point, the priests will perform the Divine Liturgy. The final step comes when a blindfolded child, an altar boy to be chosen on Saturday, will pick a paper from the box and give it to the acting pope, who will read the name of the 118th Coptic Pope. The acting pope will then open and also read the other two papers to ensure transparency. The Church says they received requests from roughly 80 children from all over Egypt to mediate the choice of the new religious leader. A day before the lottery the list of children will be whittled down from 80 to 12, a symbolic reference to the 12 Apostles, according to the supervisor of the papal elections, Bishop Paul. On Sunday, Archbishop Pachomios, the acting Pope, will then randomly choose one child from the 12 for the ultimate position. "The children that will participate in the altar lottery are between 5-8 years old, ordained as an altar boy, and their families have submitted their child's birth certificate and application for this event," said Paul. He added that the Church only sent invitations to public figures who requested to attend the lottery. Immediately after the new pope is announced, the Church will start organising the ordaining ceremony to take place in St Mark's Coptic Orthodox Cathedral in Abassiya, Cairo, on Sunday 18 November. Bishop Pachomios, the acting Pope, said the ceremony will be international, as the church plans to invite representatives of all the embassies and ministries , and public figures in Egypt and abroad as well as heads of all other Churches, including the Vatican. "We invited President Mohamed Morsi to attend the ceremony; he promised to attend, time permitting; If he doesn't he said he would visit us later," said Pachomios. A group of Copts, however, launched a Facebook page to express their disapproval of the idea of President Morsi attending the ceremony, arguing that the huge numbers of security guards required for such visit will hinder every day Copts from attending and enjoying this great moment. The Facebook protesters also criticised Morsi's performance in office, and held him responsible for increasing 'Coptic misery' since he became president. “I am very happy that the Coptic community is very satisfied with the result of the elections and the three finalists, credit goes to God who responded to the Coptic prayers and fasting,” said Bishop Pachomios. However, Egypt's 118th Coptic Pope, say informed observers, can expect to face a number of major challenges from day one. Youssef Sidhom, member of the church's lay council and editor-in-chief of Coptic weekly, Watany, said the new pope "must be able to deal wisely with government institutions, Egypt's varied political and religious trends and with other Christian churches." Sidhom added, however, that the most critical issue facing the next Coptic patriarch would be obtaining state approval to amend the church's 1938 bylaws – which lay down the rules governing Coptic divorce and remarriage – and the controversial 1957 bylaws regulating papal elections. Coptic activist Michael Meunier, president of El-Hayat Party (The Life Party) told Ahram Online he believes the Church is in need of restructuring. Meunir also believes that the church should appoint a media spokesperson, overhaul the Lay Council to allow congregants to replace clergymen in order to separate the provision of religious services from politics and, finally, to pressure for governmental approval for a law that would ease regulatuions on the building and restoring of churches, to achieve parity conditions with Muslim mosques. Bishop Rafael garnered 1980 votes, the highest among all the candidates, taking 32.36 per cent of total votes. He is one of the prominent names in the Holy Synod, by virtue of being the bishop of Central Cairo, the auxiliary to Bishop Moses, General Bishop and Administrator for the Bishopric of Youth Affairs. In general he enjoys wide popularity among Copts. Archbishop Mikhail of Assiut, the most senior and elder archbishop in the Holy Synod who has seen three Coptic popes enter and exit the seat, was one of several prominent people had nominated Rafael in the papal elections. Although he has not been a media presence for 15 years since he was ordained bishop in 1997, Rafael gained popularity in the Coptic community through his sermons in Saint Mark's Cathedral in Azbakiya, Cairo, attended by thousands of Coptic youth. Bishop Tawadros, the General Bishop of El-Beheira, in Egypt's Delta region received 1623 votes, taking 26.53 per cent of total votes. Tawadros was supported by members of the Coptic Laity Council for "his wisdom, firmness and ability to maintain good rapport everyone in his province; both Christians and Muslims alike." Father Raphael received 1530 votes, totalling 25 per cent of the votes. He was nominated by bishops who were ordained at St. Mina Monastery, like Bishop Armiah, secretary of the late Pope Shenouda III. 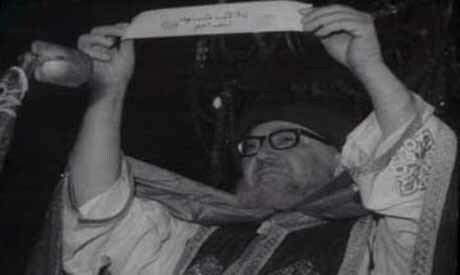 Copts think highly of Ava Mina, since he was deacon and the secretary of Pope Cyril VI, the 116 Pope, who was known as the "man of prayer and miracles." He is backed by those who reject the idea of nominating Diocesan Bishops for papacy, convinced that monks are better suited for a papal seat. Surprising that a religious head is chosen by lottery! Lottery is banned in many countries as a form of gambling! Why not choose the democratic way and elect the one who got highest number of votes? Will anyone explain. The choice of a Coptic Pope by a blind-folded altar boy who would pick one of the three finalists is very interesting and rather strange. This is the first time I hear about picking a Pope by a blinded boy! It is the luck of the draw! Will it be one of the two bishops or will it be the monk? Probably, God will guide the boy in making the choice! Frankly, it is strange to choose a Pope in this fashion.Will this method be extended to choosing a President of a nation ?Maybe this is the most democratic way in picking a leader! On Tuesday, American voters will choose the 45th President ! Why not try this Egyptian method? Great event that brings some silly questions. The article mixes religion and politics. It looks like President Mohamed Morsi will be blamed either he attends or not, and certainly for been a President. I have few "silly, but educational" questions for the editor: Is there a dress code for the nominees? When there were five nominees, I noticed that AO posted a photo for the five wearing black. However, when the process went to semi final, AO posted a photo for the three wearing white. I remember Pope Shenouda used to wear more elaborate costume. The other question is concerning the use of boys to select the Pope, why not girls, or grown up with vision impaired? At any rate, best wishes for the new Pope.